Teeth sometimes loose structural integrity. Whether due to cavities, breakage, cracked old filling material or uneven surfaces. myRestore utilizes the most advanced composite resin and ceramic materials to restore a tooth to natural and functional aesthetics. Small structural issues can be dealt with using bonded direct composite resin restorations, these are placed directly into the tooth and polymerized. 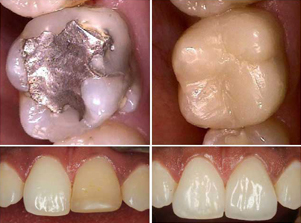 These restorations can last a very long time and require periodic maintenance. Larger structural compromise requires us to use a stronger more resistant material. At the DH Smile Center we use Composite Laboratory Fabricated Onlays made out of Enamle Plus HRi Composite Resin that is used to replace lost tooth structure.Our aim then is to protect the tooth and not further compromise it structurally. Full coverage crowns are more rarely used because of the aggressive preparation, but when needed we use E.Max and Prettau Zirconia crowns that are highly aesthetic and very strong. The myRestore solutions will help protect your teeth and ensure that the chewing you do will cause minimal damage. To find out which solutions and materials will best be suited for your needs call us or Click Here to set-up an appointment.